Gould Residence — Jeff Svitak Inc. Upon detailed analysis of the site, situated on a quiet street in the South Park neighborhood of San Diego, the most appropriate approach to the design was of humbleness and inward discovery. With this intent, the existing craftsmen style home is left almost completely intact with slight modifications to the interior walls, a remodel of the kitchen and living space, and a low sitting new addition to the back of the house. The changes were studied to be subtle in physicality and dramatic in spatial quality. 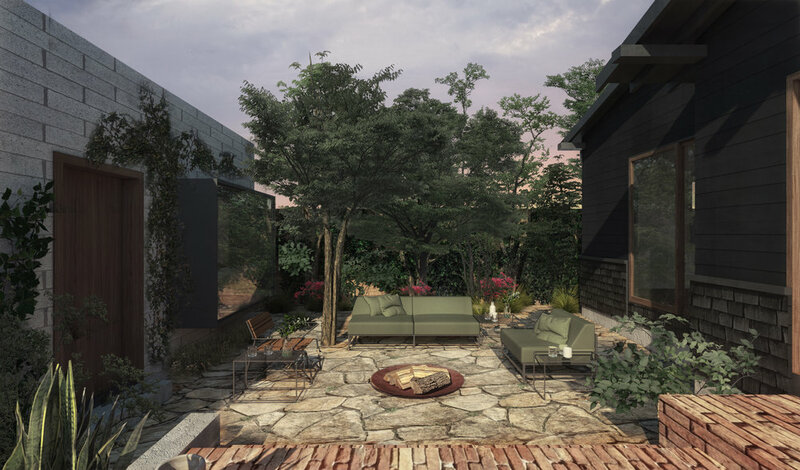 From the backyard patio, an elevation drops into an organic courtyard space, lying comfortably in between the existing house and the new addition. This space is a relaxed and reclusive environment to be used year-round in the mild climate and plays as a central circulation filter for all the areas of the house. Directly off the courtyard space is a wooden door to access the new addition of a master bedroom. The added volume is delicate and rural in it’s design and materiality, exposing all the natural elements of the architecture and it’s structural character. Exposed white concrete masonry blocks create the walls, exposed wood beams define the ceiling, and an expansive glass sliding door opens the space up to the outdoor garden. There is small reading nook facing the courtyard next to the bed, and the concrete floor flows continuously from the inside to the outdoor covered patio area. Opposite the bedroom, is the open bathroom layout containing a vanity sink, closet and open bath tub. A room comfortable enough to stay in for extended lengths of time if desired. Directly behind the bathroom is a 12’ high narrow volume with interior onyx lined walls and ceilings and a glass ceiling open to the sky. This space holds together the shower and water closet and is private from all other spaces, while maintaining extensive natural light. All together, the spaces of the house flow dynamically together, and while diverse, fill the role for all the activities and life-styles of a family home.